Even though I don't travel as much as I would like (which is difficult with a toddler for me! ), my escape usually comes out through food. This time, it's a visit to the Caribbean in this dish. 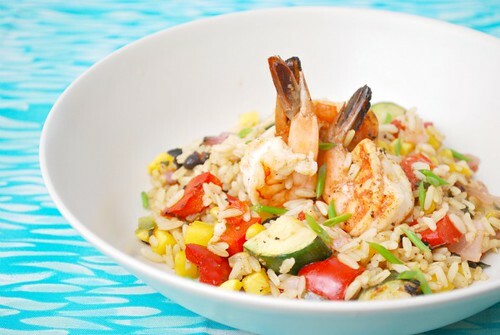 The Jamaican jerk seasoning is the key ingredient here because it ties together the vegetables, shrimp and rice. Without, it really doesn't have that 'island' flavor. Chopped fresh mango is added with a hint of squeezed lime juice for a pop of brightness. This dish would make for a great summer meal for those outdoor parties! In a cast iron skillet, add 2 teaspoons olive oil. When it begins to smoke, add the zucchini, bell pepper and onion, and cook until softened and slightly caramelized. Remove from pan and transfer to a large bowl. Add the shrimp and Jamaican jerk seasoning to the now empty skillet and cook until pink, which takes only a few minutes. Transfer the cooked shrimp to the bowl. Add the rice to the bowl, along with the lime juice, remaining teaspoon of olive oil, salt and pepper and mango.